…but as the weather has been a bit cold and miserably I’ve spent more time than usual in the house this weekend, so I’ve been using the time to do a few frugal crafty makes. Our house is quite cold, so I’ve been looking at things I can make to help keep us all a bit warmer. My first big project is to make some blinds for our lounge. I bought some material on a market some time ago and this weekend I’ve started making blinds for two windows. I’m going to hunt round the charity shops for a blanket to line them with to give extra insulation. I’m taking pictures as I go, and if it works out, I’ll put up a post about it. I’ve also started making a big crochet throw for our bed. I did think about having a go at making a quilt, but I don’t really know where to start with quilting. 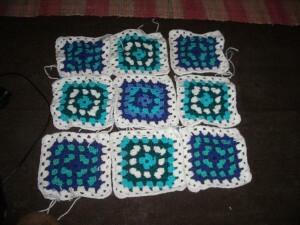 After a quick browse on the internet, I managed to remember how to make granny squares. I’m just doing a little bit every evening or when I have a few minutes spare. The design has just sort of emerged – I had the idea of using blues, greens and white and I’ll just see what happens by putting blocks of 9 together. It’s going to take a while, so here’s my first block. Have you done any frugal crafty makes for your home? I have some willow trees on the green opposite my house and I have been collecting branches and twigs that come down in high winds. My plan is to make some of those lovely woven willow hearts, stars etc I’m seeing everywhere these days. I can’t pay £10 for one in a store so I’m hoping to make my own. If successful I will make some I can give as gifts too !! Piglet, I can beat your 3 year blanket project. I started making a Readicut rug when I got engaged – in 1962. It resides in its box, complete with Readicut wools and hook, in the bottom of my built-in wardrobe. One day . . . I have 210 wool squares in cream wool, all 6″ square. They just need sewing together for a double blanket. I finished knitting them 4 years ago. I have the material for two Roman blinds . . and the instructions . . I should have said – the block looks good. I must hunt out any odd balls of wool that I have that you might use. It will reduce my stash and come in handy for you. The Blanket – say no more. (I started it over 3 years ago and it still resides behind the sofa). I made a door curtain out of a pair of old curtains and am now on the hunt for some really thick fabric to make two pairs of curtains for eldest’s bedroom. And your blog tonight has reminded me – we must do craft night! Yes, we seem to have missed a craft night – we must organise one soon. The wreath looks fauluobs Tawney. Did it last all through December?I made my own wreath too and was very impressed with it. 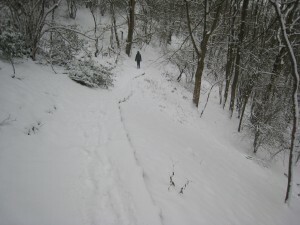 I will be wandering Frugal Hill again next year gathering all I need to make another. I will never buy another Christmas wreath again. Hi Marian, yes, the wreath did last right up until 12th night. I had to replace the odd sprig of holly but it was fine.